That is a fascinating observation. But I think Apple basically tells everyone not to rely on it for monitoring. 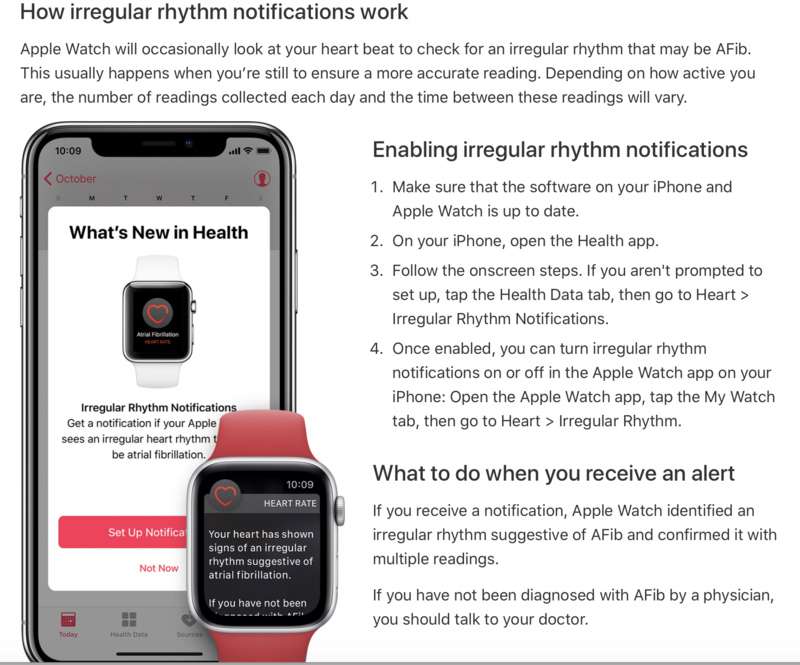 In case you doubt that Apple is serious about moving this technology forward, they have partnered with Stanford in an ongoing study with over 400,000 enrolees and are paying for physician visits and confirmatory monitoring for users who have AF alerts on the watch. Serious coin?? In all fairness, Kardia’s similar “SmartRhythm” function does not do a very good job of notifying you of afib either. I’ve had several false positives and many false negatives. Finally I just turned it off because all it added to the equation was running down the battery on my Apple Watch! The Kardia analysis function is also not stellar often interpreting NSR as Afib when presented with too many ectopic beats. That said, I value my Kardia Band for the accuracy of the single lead tracings, most of which I have learned to interpret and those I can’t I just email to my EP. I haven’t tried the Watch 4 yet, but I would not pass on it because of the alert function or even the provided analysis. I would pass on it, however, if the tracings themselves were not as accurate as the Kardia. From your first review, it sounds like the Watch 4’s tracings might not be as good, but I welcome upcoming reports when you have a larger sample. I haven’t had any positive or negative experiences with SmartRhythm so it is good to get your feedback on its lack of efficacy. When I compare the quality of the AW4 ECG tracing and the Kardia they appear very similar except in the one bizarre AW4 tracing I described. Did you do a repeat AW4 tracing on the same patient? I’ve gotten some bizarre one-offs on my Kardia Band (maybe it was too loose or I was moving) but the Kardia always corrected itself the next time. Keep the anecdotal stories coming, because unlike yourself, most of the reviewers don’t know anything about this function or what to look for. There’s only so much time I can spend during a busy office day putzing around putting watches on my patient’s wrists so the watch got one shot but but displayed the same pseudo VT despite tweaks of the finger and wrist positions throughout the tracing. I was considering buying an Apple Watch to have this feature. I have paroxysmal Afib and I wanted a record of it to show my doctor. Not buying it. I know instantly when I am in Afib and use my blood pressure monitor to record it. 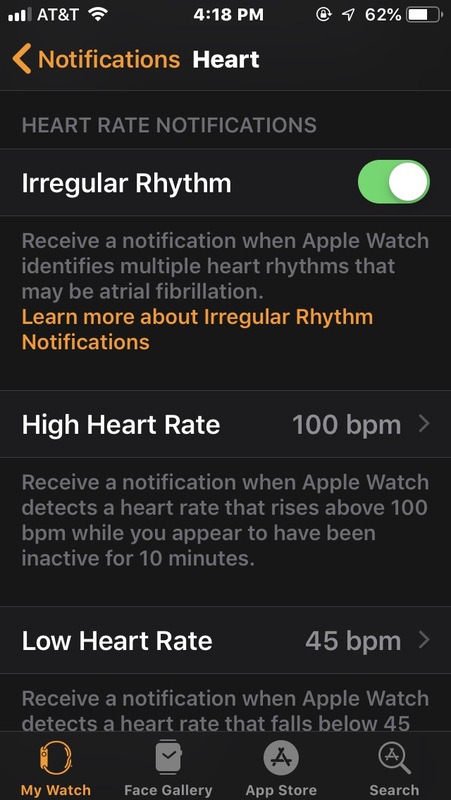 Keep in mind the AF detection/notification feature is different from the ECG feature. If you can feel when you are in AF or if your BP monitor alerts you, with the AW4 you can make an ECG recording of it and send that to your doctor as proof. On the other hand for 99$ you can get an AliveCor which does the same thing. I’ve been using an AW3 and Kardia band with the Kardia app Smart Rhythm for about a year. While the watch or Smart Rhythm or both have made many errors reporting an abnormal heart rhythm, when app reports from the Kardia Band ECG reports ‘possible afib,’ I’ve actually been in afib, and when it reports ‘Normal,’ there seems to be no evidence suggesting otherwise. I’ve gotten false rhythm warnings when making lots of successive strokes with colored pencils. My watch had fits when I was on a bus tour, and the bus was vibrating due to road conditions. (I think my wrist was resting on or very near the bus window.) Long ago I learned to end Smart Rhythm before removing the watch for charging. Alternating current totally freaks out the app. Thanks for the report on these devices. Good advice.